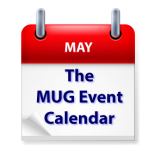 This week’s MUG Event Calendar lists events that range a discussion of how to borrow e-books from your local library at a New Zealand group, to a Movie Night at a Connecticut group, to a very special visit from the Apple Store to a Florida group. Connecticut Mac Connection – Movie Night! Suffolk Mac User Group (U.K.) – How to create a holiday movie that people will want to watch again and again!